August was the bloodiest month this year for civilians in Yemen with more than 300 children among the casualties. This comes after over 3 years of brutal conflict that has become what the UN calls the world’s largest humanitarian crisis. Millions are on the verge of starvation, as vital goods like food, fuel and humanitarian aid have been blocked from coming through Yemen’s major ports, and the country’s economy, health and education services have collapsed. These latest grim figures come as the first talks in two years are scheduled to take place in Geneva to try to secure peace. Reports compiled by the UN’s civilian impact monitoring department show that in the first nine days of August there were more than 450 civilian casualties, including 131 children. By August 31, 981 civilians had been killed or injured, including over 300 children. Congress has asked the State Department a set of straightforward questions around our support for Saudi Arabia and United Arab Emirates (UAE). The State Department can tell the truth and put its weight behind the peace process, or lie to perpetuate a self-defeating and morally repugnant Yemen policy. How many more children will be killed before the backers of this war will own up to their complicity? 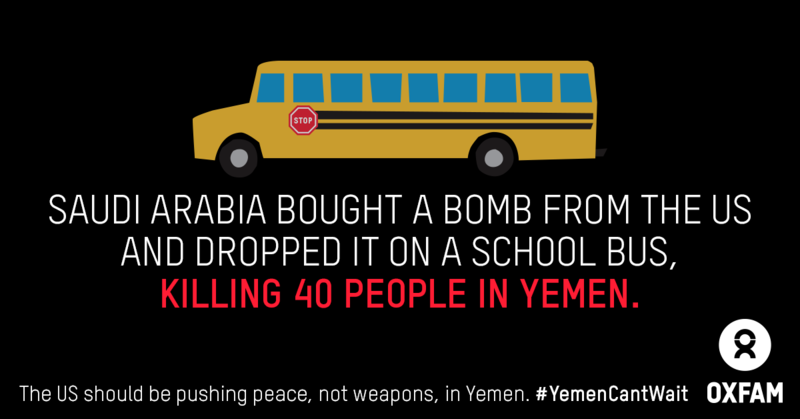 In one of the bloodiest attacks of the month, Saudi Arabia dropped a bomb purchased from the US on a school bus, killing 40, over half of them children. The US-supported coalition, led by Saudi Arabia and the United Arab Emirates, is responsible for the majority of the civilian casualties in the conflict. “When I visited Yemen in July, I met families who bravely go about their everyday lives, but with a constant fear for their safety, and it pains me to know that the United States is playing an active role in that danger. The bloodshed has to end and the US can help stop it by ending refueling, arms sales, and any other military support for the coalition in Yemen,” said Maxman. All warring parties continue to commit violations of the rules of war. According to the UN, between March 26, 2015 and August 9, 2018 there were a total of 17,062 civilian casualties. The majority of these casualties, 10,471, were as a result of Saudi-led coalition airstrikes. Meanwhile the Houthis and other armed groups continue their stranglehold in Taiz and other areas where street fighting, and the use of landmines is leading to civilian casualties, and lack of access means people are denied humanitarian assistance. Despite the reported ‘pause’ in the fighting around the port city of Hudaydah, the beginning of August saw deadly mortar attacks on a busy market killing 41 civilians including six children and four women and injuring another 111 civilians. There was also a mortar attack on a hospital in the city causing many civilian casualties. There appears to be no let-up in the fighting which continues towards the south of Hudaydah with the current focus in Ad Durayhimi city. There is fighting in residential neighborhoods in the city, air strikes, mounting civilian casualties and people trapped inside the city unable to flee or get medical assistance. Aid agencies like Oxfam, are finding it difficult to help people because of the fighting and blocked roads. Damage to water and sanitation infrastructure in Hudaydah and other parts of the country is preventing thousands of people access to water and increasing the threat of a third spike in cholera cases. While the focus is on Hudyadah, fighting is also reported in other parts of the country including Lahj, Al Baydah, Sa’daa, Hajaah, Taiz and elsewhere. Oxfam has been in Yemen for more than 30 years, working with government authorities, as well as civil society organizations, to improve the water and sanitation services, and livelihoods of thousands of people living in poverty. Our focus is on women's rights, health care, disaster preparedness, and helping people have a say in the decisions that affect them. Since July 2015. Oxfam has delivered essential aid like clean water, food vouchers, cash transfer and hygiene kits to more than 1 million people in the north and south of the country.